COMPLAINTS by cruise ship passengers include one by a woman who moaned about the sea being “too loud”, it has been revealed. And a couple accused a captain of being “rude” for sailing off when they had left a note saying they needed more sightseeing time in port, according to cruise travel agency bonvoyage .co .uk. One woman, having seen that Take That star Gary Barlow had been on her ship on an earlier trip, demanded an explanation as to why the singer was not on her voyage. Then there was the man who complained about not getting “an impressive tan” and being unable to swim in the pool each day while on a trip around … Alaska. A woman traveling with the company called Celebrity Cruises asked for a refund as there were “no celebrities on board”, while a couple wanted compensation after forking out “a lot more money than planned” on staff tips due to the excellent service. The woman who complained about the loudness of the sea said she had not been able to sleep well on her Mediterranean cruise. She demanded cabins be “better sound-proofed against the sounds of the sea”. Another female traveller, having booked an inside cabin, then complained about not having a view of the sea and asked for a window to be installed. Bonvoyage.co.uk cruise development manager Steph Curtin said: “From time to time we come across a few quirky complaints that we can do little to help. Kevin Brown, a senior vice president at Sotheby’s International who specializes in selling New York’s most prestigious property, said the unnamed woman had snapped up the apartment in preparation for when her child eventually becomes a student. ‘Well why are you buying? '” Mr Brown said to CCTV, the Chinese state broadcaster. 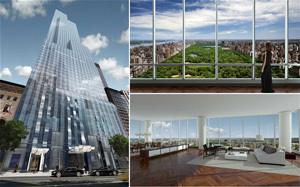 The apartment is in the One57 tower, a 90-floor glass skyscraper on 57th street between Sixth and Seventh avenues and overlooking Central Park. The building, which is still unfinished, was designed by a Pritzker prize-winning architect and boasts a library with a pool table and 24ft aquarium, a private concert hall, and a “pet wash room”. It will be managed by the Park Hyatt hotel brand. At least one other Chinese billionaire, Silas KF Chou of Hong Kong, has also bought a $50 million apartment in the block, according to the New York Times and the two penthouses in the block have both been sold for $90 million, making them the most expensive single properties in Manhattan. Mr Brown said Chinese buyers now make up a quarter of his business, in dollar terms. While foreigners only account for two to three per cent of the houses sold in New York, around 11 per cent of that market is now made up by Chinese, who spent $9 billion on property in the United States last year. Philadelphia, PA, is getting ready for a supersized game of Pong. The classic Atari video game will come to life on the facade of a 29-story skyscraper. Hundreds of built-in LED lights at the Cira Centre will replicate the familiar paddles and ball. The effort is the brainchild of Frank Lee, a Drexel University game-design professor. 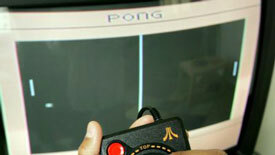 Pong will be played April 19 and 24, to bookend an event called Philly Tech Week. The black-and-white arcade game introduced in 1972 had no complicated graphics, just geometric shapes. Players controlled digital paddles and tried to hit the ball so their opponents could not return it. A home version paved the way for the game console industry. In Philadelphia, gamers will control their paddles from afar, standing across the Schuylkill River from the building. It had previously been thought that only humans and animals that had an inborn vocal mimicry ability, such as parrots, were capable of being able to identify a song’s rhythm and responding to it. But Peter Cook, a graduate student at the University of California, and his fellow researchers have managed to show that beat keeping does not necessarily go hand in hand with complex vocal learning by teaching sea lion bob its head to a range of songs. Despite the sea lion’s never having heard Boogie Wonderland by Earth, Wind and Fire, the animal managed to synchronise its body movements to the five different tempos of the song. Ronan, who is the first non-human mammal to exhibit this ability, also showed a liking for Everybody by the Backstreet Boys.